Danny Kaye (born David Daniel Kaminsky; Yiddish: אַניעל דאַװיד קאַמינסקי‎; January 18, 1911 – March 3, 1987) was an American actor, singer, dancer, comedian, musician, and philanthropist. His performances featured physical comedy, idiosyncratic pantomimes, and rapid-fire novelty songs. Kaye starred in 17 movies, notably Wonder Man (1945), The Kid from Brooklyn (1946), The Secret Life of Walter Mitty (1947), The Inspector General (1949), Hans Christian Andersen (1952), White Christmas (1954), and The Court Jester (1956). David Daniel Kaminsky was born in Brooklyn, New York, on January 18, 1911 (though he would later say 1913), to Ukrainian Jewish immigrants Jacob and Clara (née Nemerovsky) Kaminsky. He was the youngest of three sons. Jacob and Clara and their older sons Larry and Mac left Dnipropetrovsk two years before Danny's birth; he was their only son born in the United States. He attended Public School 149 in East New York, Brooklyn; the school eventually was renamed to honor him—where he began entertaining his classmates with songs and jokes. He attended Thomas Jefferson High School in Brooklyn but he did not graduate. His mother died when he was in his early teens. Not long after his mother's death, Kaye and his friend Louis ran away to Florida. Kaye sang while Louis played the guitar and the pair eked out a living for a while. When Kaye returned to New York, his father did not pressure him to return to school or work, giving his son the chance to mature and discover his own abilities. Kaye said that as a young boy he had wanted to be a surgeon, but the family could not afford a medical school education. He held a succession of jobs after leaving school: as a soda jerk, insurance investigator, and office clerk. Most ended with his being fired. He lost the insurance job when he made an error that cost the insurance company $40,000. The dentist who hired him to look after his office at lunch hour did the same when he found Kaye using his drill on the office woodwork. Years later Kaye married the dentist's daughter, Sylvia. He learned his trade in his teenage years in the Catskills as a tummler in the Borscht Belt. Kaye's first break came in 1933 when he joined the "Three Terpsichoreans," a vaudeville dance act. They opened in Utica, New York, where he used the name Danny Kaye for the first time. The act toured the United States, then performed in Asia with the show La Vie Paree. The troupe left for a six-month tour of the Far East on February 8, 1934. While they were in Osaka, Japan, a typhoon hit the city. The hotel where Kaye and his colleagues stayed suffered heavy damage. The strong wind hurled a piece of the hotel's cornice into Kaye's room; had he been hit, he might well have been killed. By performance time that evening the city was in the grip of the storm. There was no power and the audience was restless and nervous. To calm them Kaye went on stage holding a flashlight to illuminate his face and sang every song he could recall as loudly as he was able. The experience of trying to entertain audiences who did not speak English inspired him to the pantomime, gestures, songs, and facial expressions that eventually made his reputation. Sometimes he found pantomime necessary when ordering a meal. Kaye's daughter, Dena, tells a story her father related about being in a restaurant in China and trying to order chicken. Kaye flapped his arms and clucked, giving the waiter an imitation of a chicken. The waiter nodded in understanding, bringing Kaye two eggs. His interest in cooking began on the tour. Jobs were in short supply when Kaye returned to the United States, and he struggled for bookings. One job was working in a burlesque revue with fan dancer Sally Rand. After the dancer dropped a fan while trying to chase away a fly, Kaye was hired to watch the fans so they were always held in front of her. Danny Kaye made his film debut in a 1935 comedy short Moon Over Manhattan. In 1937 he signed with New York–based Educational Pictures for a series of two-reel comedies. He usually played a manic, dark-haired, fast-talking Russian in these low-budget shorts, opposite young hopefuls June Allyson and Imogene Coca. The Kaye series ended abruptly when the studio shut down in 1938. He was working in the Catskills in 1937 under the name Danny Kolbin. His next venture was a short-lived Broadway show with Sylvia Fine as the pianist, lyricist, and composer. The Straw Hat Revue opened on September 29, 1939, and closed after 10 weeks, but critics took notice of Kaye's work. The reviews brought an offer for both Kaye and his bride Sylvia to work at La Martinique, a New York City nightclub. Kaye performed with Sylvia as his accompanist. At La Martinique playwright Moss Hart saw Danny perform, and that led to Hart's casting him in his hit Broadway comedy Lady in the Dark. 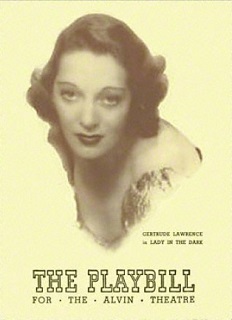 Kaye scored a triumph at age 30 in 1941 playing Russell Paxton in Lady in the Dark, starring Gertrude Lawrence. His show-stopping number was "Tchaikovsky" by Kurt Weill and Ira Gershwin in which he sang the names of a string of Russian composers at breakneck speed, seemingly without taking a breath. In the next Broadway season he was the star of a show about a young man who is drafted called Let's Face It!. His feature-film debut was in producer Samuel Goldwyn's Technicolor 1944 comedy Up in Arms, a remake of Goldwyn's Eddie Cantor comedy Whoopee! (1930). Rival producer Robert M. Savini cashed in by compiling three of Kaye's Educational Pictures shorts into a patchwork feature entitled The Birth of a Star (1945). Studio mogul Goldwyn wanted Kaye's prominent nose fixed to look less Jewish, Kaye refused, but he did allow his red hair to be dyed blond, apparently because it looked better in Technicolor. Kaye starred in a radio program, The Danny Kaye Show, on CBS in 1945–46. The program's popularity rose quickly. Before a year he tied with Jimmy Durante for fifth place in the Radio Daily popularity poll. Kaye was asked to participate in a USO tour following the end of World War II. It meant that he would be absent from his radio show for nearly two months at the beginning of the season. Kaye's friends filled in, with a different guest host each week. Kaye was the first American actor to visit postwar Tokyo. He had toured there some 10 years before with the vaudeville troupe. When Kaye asked to be released from his radio contract in mid-1946 he agreed not to accept a regular radio show for one year and only limited guest appearances on other radio programs. Many of the show's episodes survive today, notable for Kaye's opening "signature" patter ("Git gat gittle, giddle-di-ap, giddle-de-tommy, riddle de biddle de roop, da-reep, fa-san, skeedle de woo-da, fiddle de wada, reep!"). Kaye starred in several movies with actress Virginia Mayo in the 1940s and is known for films such as The Secret Life of Walter Mitty (1947), The Inspector General (1949), On the Riviera (1951) co-starring Gene Tierney, Knock on Wood (1954), White Christmas (1954), The Court Jester (1956), and Merry Andrew (1958). Kaye starred in two pictures based on biographies, Hans Christian Andersen (1952) the Danish storyteller and The Five Pennies (1959) about jazz pioneer Red Nichols. His wife, writer/lyricist Sylvia Fine, wrote many tongue-twisting songs for which Kaye became famous. She was also an associate film producer. Some of Kaye's films included the theme of doubles, two people who look identical (both Danny Kaye) being mistaken for each other to comic effect. 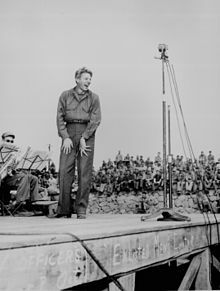 Danny Kaye on USO tour at Sasebo, Japan, October 25, 1945. Kaye and his friend, Dodgers manager Leo Durocher, made the trip. He doesn't have any first name. Even his wife calls him just Kaplan. He's an illiterate pompous character who advertises his philanthropies. Jack Benny or Dore Schary might say, "Kaplan, why do you hate unions so?" If Danny feels like doing Kaplan that night he might be off on Kaplan for two hours. When he appeared at the London Palladium in 1948 he "roused the Royal family to laughter and was the first of many performers who have turned British variety into an American preserve." Life magazine described his reception as "worshipful hysteria" and noted that the royal family, for the first time, left the royal box to watch from the front row of the orchestra. He related that he had no idea of the familial connections when the Marquess of Milford Haven introduced himself after a show and said he would like his cousins to see Kaye perform. Kaye stated he never returned to the venue because there was no way to recreate the magic of that time. Kaye had an invitation to return to London for a Royal Variety Performance in November of the same year. When the invitation arrived, Kaye was busy with The Inspector General (which had a working title of Happy Times). Warner Bros. stopped the film to allow their star to attend. When his Decca co-workers the Andrews Sisters began their engagement at the London Palladium on the heels of Kaye's successful 1948 appearance there, the trio was well received and David Lewin of the Daily Express declared: "The audience gave the Andrews Sisters the Danny Kaye roar!" He hosted the 24th Academy Awards in 1952. The program was broadcast on radio. Telecasts of the Oscar ceremony came later. During the 1950s Kaye visited Australia, where he played "Buttons" in a production of Cinderella in Sydney. In 1953 Kaye started a production company, Dena Pictures, named for his daughter. Knock on Wood was the first film produced by his firm. The firm expanded into television in 1960 under the name Belmont Television. Kaye entered television in 1956, on the CBS show See It Now with Edward R. Murrow. The Secret Life of Danny Kaye combined his 50,000-mile, ten-country tour as UNICEF ambassador with music and humor. His first solo effort was in 1960 with an hour special produced by Sylvia and sponsored by General Motors; with similar specials in 1961 and 1962. 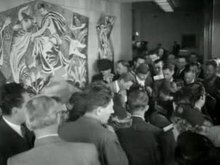 Kaye at Schiphol on October 5, 1955. He hosted a The Danny Kaye Show from 1963 to 1967; it won four Emmy awards and a Peabody award. His last cinematic starring role came in 1963's The Man from the Diners' Club. Beginning in 1964 he acted as television host to the CBS telecasts of MGM's The Wizard of Oz. Kaye did a stint as a What's My Line? mystery guest on the Sunday night CBS-TV quiz program. Kaye was later a guest panelist on that show. He also appeared on the interview program Here's Hollywood. In the 1970s Kaye tore a ligament in his leg during the run of the Richard Rodgers musical Two by Two but went on with the show, appearing with his leg in a cast and cavorting on stage in a wheelchair. He had done much the same on his television show in 1964 when his right leg and foot were burned from a cooking accident. Camera shots were planned so television viewers did not see Kaye in his wheelchair. In 1976 he played Mister Geppetto in a television musical adaptation of Pinocchio with Sandy Duncan in the title role. Kaye portrayed Captain Hook opposite Mia Farrow in a musical version of Peter Pan featuring songs by Anthony Newley and Leslie Bricusse. He later guest-starred in episodes of The Muppet Show, The Cosby Show, and in the 1980s revival of New Twilight Zone. In many films, as well as on stage, Kaye proved to be an able actor, singer, dancer, and comedian. 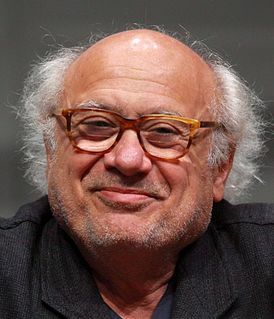 He showed his serious side as ambassador for UNICEF and in his dramatic role in the memorable TV film Skokie, when he played a Holocaust survivor. Before his death in 1987, Kaye conducted an orchestra during a comical series of concerts organized for UNICEF fundraising. Kaye received two Academy Awards: an Academy Honorary Award in 1955 and the Jean Hersholt Humanitarian Award in 1982. That year he received the Screen Actors Guild Annual Award. In 1980 Kaye hosted and sang in the 25th Anniversary of Disneyland celebration and hosted the opening celebration for Epcot in 1982 (EPCOT Center at the time). Both were aired on prime-time television in the U.S.
Kaye was enamored of music. While he claimed an inability to read music, he was said to have perfect pitch. A flamboyant performer with his own distinctive style, "easily adapting from outrageous novelty songs to tender ballads" (according to critic Jason Ankeny), in 1945 Kaye began hosting his own CBS radio program, launching a number of hit songs including "Dinah" and "Minnie the Moocher." In 1947 Kaye teamed with the popular Andrews Sisters (Patty, Maxene, and LaVerne) on Decca Records, producing the number-three Billboard hit "Civilization (Bongo, Bongo, Bongo)." The success of the pairing prompted both acts to record through 1950, producing rhythmically comical fare as "The Woody Woodpecker Song" (based on the bird from the Walter Lantz cartoons and a Billboard hit for the quartet), "Put 'em in a Box, Tie 'em with a Ribbon (And Throw 'em in the Deep Blue Sea)," "The Big Brass Band from Brazil," "It's a Quiet Town (In Crossbone County)," "Amelia Cordelia McHugh (Mc Who? )," "Ching-a-ra-sa-sa," and a duet by Danny and Patty Andrews of "Orange Colored Sky." The acts teamed for two yuletide favorites: a frantic, harmonic rendition of "A Merry Christmas at Grandmother's House (Over the River and Through the Woods)" and a duet by Danny and Patty, "All I Want for Christmas Is My Two Front Teeth." Kaye's debut album, Columbia Presents Danny Kaye, had been released in 1942 by Columbia Records with songs performed to the accompaniment of Maurice Abravanel and Johnny Green. The album was reissued as a Columbia LP in 1949 and is described by the critic Bruce Eder as "a bit tamer than some of the stuff that Kaye hit with later in the '40s and in the '50s and, for reasons best understood by the public, doesn't attract nearly the interest of his kids' records and overt comedy routines." 1950 saw the release of a Decca single, "I've Got a Lovely Bunch of Coconuts," his sole big U.S. chart hit. His second Columbia LP album Danny Kaye Entertains (1953, Columbia), included six songs recorded in 1941 from his Broadway musical Lady in the Dark; most notably "Tchaikovsky." Following the success of the film Hans Christian Andersen (1952), two of its songs written by Frank Loesser and sung by Kaye, "The Ugly Duckling" and "Wonderful Copenhagen," reached the Top Five on the UK pop charts. In 1953 Decca released Danny at the Palace, a live recording made at the New York Palace Theater, followed by Knock On Wood (Decca, 1954) a set of songs from the movie of the same name sung by Kaye, accompanied by Victor Young and His Singing Strings. In 1956 Kaye signed a three-year recording contract with Capitol Records, which released his single "Love Me Do" in December of that year. The B-side, "Ciu Ciu Bella", with lyrics written by Sylvia Fine, was inspired by an episode in Rome when Kaye, on a mission for UNICEF, befriended a 7-year-old polio victim in a children's hospital, who sang this song for him in Italian. In 1958 Saul Chaplin and Johnny Mercer wrote songs for Merry Andrew, a film starring Kaye as a British teacher attracted to the circus. The score added up to six numbers, all sung by Kaye; conductor Billy May's 1950 composition "Bozo's Circus Band" (renamed "Music of the Big Top Circus Band") was deposited on the second side of the Merry Andrew soundtrack, released in 1958. A year later another soundtrack came out, The Five Pennies (Kaye starred there as 1920s cornet player Loring Red Nichols), featuring Louis Armstrong. In the 1960s and 1970s Kaye regularly conducted world-famous orchestras, although he had to learn the scores by ear. Kaye's style, even if accompanied by unpredictable antics (he once traded the baton for a fly swatter to conduct "The Flight of the Bumblebee") was praised by the likes of Zubin Mehta who once stated that Kaye "has a very efficient conducting style." His ability with an orchestra was mentioned by Dimitri Mitropoulos, then conductor of the New York Philharmonic Orchestra. After Kaye's appearance Mitropoulos remarked, "Here is a man who is not musically trained, who cannot even read music and he gets more out of my orchestra than I have." Kaye was invited to conduct symphonies as charity fundraisers and was the conductor of the all-city marching band at the season opener of the Los Angeles Dodgers in 1984. Over his career he raised over US$5 million in support of musician pension funds. The 1946 Warner Bros. cartoon Book Revue had a sequence with Daffy Duck wearing a blond wig and impersonating Kaye. Satirical songwriter Tom Lehrer's 1953 song "Lobachevsky" was based on a number that Kaye had done, about the Russian director Constantin Stanislavski, with the affected Russian accent. Lehrer mentioned Kaye in an opening monologue, citing him as an "idol since childbirth." Superman creators Jerry Siegel and Joe Shuster fashioned a short-lived superhero title, Funnyman, taking inspiration from Kaye's persona. In his later years, Kaye entertained at home as chef. He specialized in Chinese and Italian cooking. He had a custom-made Chinese restaurant installed at the rear of his house by its alley, then had a kitchen and dining area built around it. The stove that Kaye used for his Chinese dishes was fitted with metal rings for the burners to allow the heat to be highly concentrated, and a trough with circulating ice water cooled the area to keep the intense heat tolerable for those who were cooking. He learned "at Johnny Kan's restaurant in San Francisco and with Cecilia Chang at her Mandarin restaurants in San Francisco and Los Angeles." He taught Chinese cooking classes at a San Francisco Chinese restaurant in the 1970s. The theater and demonstration kitchen under the library at the Hyde Park, New York campus of the Culinary Institute of America is named for him. Kaye referred to his kitchen as "Ying's Thing." While filming The Madwoman of Chaillot in France, he phoned home to ask his family if they would like to eat at Ying's Thing that evening; Kaye flew home for dinner. Not all of his efforts in the kitchen went well. After flying to San Francisco for a recipe for sourdough bread, he came home and spent hours preparing loaves. When his daughter asked about the bread, Kaye hit the bread on the kitchen table; his bread was hard enough to chip it. Kaye approached kitchen work with enthusiasm, making sausages and other foods needed for his cuisine. His work as a chef earned him the "Les Meilleurs Ouvriers de France" culinary award. Kaye is the only nonprofessional chef to have received this honor. Kaye was an aviation enthusiast and pilot. He became interested in getting a pilot's license in 1959. An enthusiastic and accomplished golfer, he gave up golf in favor of flying. The first plane Kaye owned was a Piper Aztec. Kaye received his first license as a private pilot of multi-engine aircraft, not being certified for operating a single-engine plane until six years later. He was an accomplished pilot, rated for airplanes ranging from single-engine light aircraft to multi-engine jets. Kaye held a commercial pilot's license and had flown every type of aircraft except military planes. Kaye received a type rating in a Learjet, and he was named vice president of the Learjet company by Bill Lear as an honorary title (he had no line responsibility at the company). He supported many flying projects. In 1968 he was honorary chairman of the Las Vegas International Exposition of Flight, a show that utilized many facets of the city's entertainment industry while presenting an air show. The operational show chairman was well-known aviation figure Lynn Garrison. Kaye flew a Learjet to 65 cities in five days on a mission to help UNICEF. In 1958 Kaye and partner Lester Smith formed Kaye–Smith Enterprises. The company owned a chain of radio stations, mostly in the Pacific Northwest. Other Kaye–Smith divisions included a concert promotion company, a video production company, and a recording studio. Kaye sold his share of the company to the Smith family in 1985. A lifelong fan of the Brooklyn/Los Angeles Dodgers, Kaye recorded a song called "The D-O-D-G-E-R-S Song (Oh really? No, O'Malley! )," describing a fictitious encounter with the San Francisco Giants, a hit during the real-life pennant chase of 1962. That song is included on Baseball's Greatest Hits compact discs. A good friend of Leo Durocher, he often traveled with the team. He also possessed an encyclopedic knowledge of the game. Kaye and his business partner Lester Smith also led an investment group which was awarded the American League's thirteenth franchise, which became the Seattle Mariners for US$6.2 million on February 7, 1976. The ownership percentages of Kaye, Smith and two other remaining original investors were reduced to 5 percent each when George Argyros purchased 80 percent of the Mariners for $10.4 million on January 30, 1981. Kaye sold all of his business interests to Smith's family in 1985. Kaye was an honorary member of the American College of Surgeons and the American Academy of Pediatrics. Working alongside UNICEF's Halloween fundraiser founder, Ward Simon Kimball Jr., the actor educated the public on impoverished children in deplorable living conditions overseas and assisted in the distribution of donated goods and funds. His involvement with UNICEF came about in an unusual way. Kaye was flying home from London in 1949 when one of the plane's four engines lost its propeller and caught fire. The problem was initially thought serious enough that it might make an ocean landing; life jackets and liferafts were made ready. The plane was able to head back over 500 miles to land at Shannon Airport, Ireland. On the way back to Shannon, the head of the Children's Fund, Maurice Pate, had the seat next to Danny Kaye and spoke at length about the need for recognition for the fund. Their discussion continued on the flight from Shannon to New York; it was the beginning of the actor's long association with UNICEF. "For all of his success as a performer . . . his greatest legacy remains his tireless humanitarian work—so close were his ties to the United Nations International Children's Emergency Fund (UNICEF) that when the organization received the Nobel Peace Prize, Kaye was tapped to accept it," according to music critic Jason Ankeny. Kaye died of heart failure on March 3, 1987, aged 76, brought on by internal bleeding and complications of hepatitis C. Kaye had quadruple bypass heart surgery in February 1983; he contracted hepatitis C from a blood transfusion. His ashes are interred in Kensico Cemetery in Valhalla, New York. His grave is adorned with a bench that contains friezes of a baseball and bat, an aircraft, a piano, a flower pot, musical notes, and a chef's toque. His name and birth and death dates are inscribed on the toque. The United Nations held a memorial tribute to him at their New York headquarters on the evening of October 21, 1987. The Sylvia and Danny Kaye Playhouse at Hunter College in New York was opened in 1988, with a $1 million gift from Sylvia Kaye. Kaye and Sylvia Fine grew up in Brooklyn, living a few blocks apart, but they did not meet until they were working on an off-Broadway show in 1939. Sylvia was an audition pianist. Sylvia discovered that Danny had worked for her father Samuel Fine, a dentist. Kaye, working in Florida, proposed on the telephone; the couple were married in Fort Lauderdale on January 3, 1940. The couple were married for life except for a separation in 1947 and 1948, when Kaye was involved with Eve Arden. The couple's only child, daughter Dena, was born on December 17, 1946. When she was very young, Dena did not like seeing her father perform because she did not understand that people were supposed to laugh at what he did. Kaye said in a 1954 interview, "Whatever she wants to be she will be without interference from her mother nor from me." Dena grew up to become a journalist. On 18 January 2013, during a 24-hour salute to Kaye on Turner Classic Movies in celebration of what TCM thought was his 100th birthday, Kaye's daughter, Dena, revealed to TCM host Ben Mankiewicz that Kaye's stated birth year of 1913 was incorrect, and that he was actually born in 1911. A Democrat, he supported Adlai Stevenson's campaign during the 1952 presidential election. Kaye was knighted by Queen Margrethe II of Denmark on November 10, 1983. He was awarded the cross of the Knight of the Dannebrog, 1st Class, for his work with UNICEF and longstanding ties with Denmark. Kaye portrayed Hans Christian Andersen in the 1952 film of the same name. Chevalier of the French Legion of Honor on February 24, 1986, for his work for UNICEF. On June 23, 1987, Kaye was posthumously presented with the Presidential Medal of Freedom by President Ronald Reagan. The award was received by his daughter Dena. In 1988, Kaye was posthumously inducted into the American Theater Hall of Fame. UNICEF created the Danny Kaye International Children's Award in his honor, a children's European singing competition shown every year between 1988 and 1992 hosted by Audrey Hepburn and Roger Moore. UNICEF's New York Visitor's Centre is named to honor Danny Kaye. In December 1996, the PBS series American Masters aired a special on Kaye's life. A street in the San Antonio, Texas, neighborhood Oak Hills Terrace (located in the city's northwest) is named after Danny Kaye. The neighborhood was established in the late 1960s. The careers of Kaye and Fine are immortalized in The Danny Kaye and Sylvia Fine Collection at the Library of Congress. The materials preserved in the collection include manuscripts, scores, scripts, photographs, sound recordings, and video clips. On June 9, 1986, Danny Kaye was crowned King of Brooklyn at the Back to Brooklyn Day Festival. Danny Kaye was there to accept his crown. ^ a b "French Honor Danny Kaye". The Modesto Bee. February 26, 1986. ^ Kaye, Dena (January 18, 2013). "Interview". Turner Classic Movies. Her father was actually born in 1911 but, for reasons unknown to her, changed it to 1913. ^ FBI records and SSDI show 1911. ^ a b "Danny Kaye Biography". UNICEF. Retrieved March 23, 2014. ^ "1980–1989 Obituaries [SSDI search]". Legacy.com/SSDI. Retrieved March 23, 2014. ^ a b c d e f g Adir, Karen, ed. (2001). The Great Clowns of American Television. McFarland & Company. p. 270. ISBN 0-7864-1303-4. Retrieved January 18, 2011. ^ "Welcome P.S. 149 Danny Kaye". New York City Dept of Education. Retrieved January 8, 2013. ^ a b c d e f "World-renowned comedian dies". Eugene Register-Guard. March 4, 1987. Retrieved December 15, 2010. ^ a b c d e Goodman, Mark (December 23, 1979). "A Conversation With Danny Kaye". Lakeland Ledger. Retrieved March 10, 2011. ^ a b Perry, Lawrence (May 9, 1954). "Danny Kaye Looks At Life". The Milwaukee Journal. ^ a b c d Battelle, Phyllis (May 8, 1959). "Mrs. Danny Kaye Proves a Genius". The Milwaukee Sentinel. ^ a b c d e f g h "Git Gat Gittle". Time. March 11, 1946. Retrieved January 14, 2011. ^ a b c d Kaye, Dena (January 19, 1969). "Life With My Zany Father-Danny Kaye". Tri City Herald. Retrieved January 15, 2011. ^ ""Highlights and Shadows"-front of program". The President Players. July 4, 1937. Retrieved February 25, 2011. 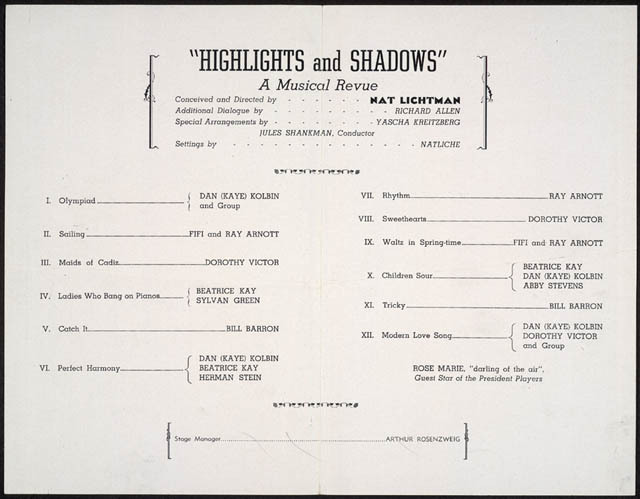 ^ ""Highlights and Shadows" – inside of program". The President Players. July 4, 1937. Retrieved February 25, 2011. ^ a b "Who Is Sylvia?". Pittsburgh Post-Gazette. October 30, 1960. Retrieved January 18, 2011. ^ a b c d e f g h "Danny Kaye, comedian who loved children, dead at 74". Wilmington Morning Star. Wilmington, North Carolina. Associated Press. March 4, 1987. Retrieved December 15, 2010. ^ a b Remington, Fred (January 12, 1964). "Danny Kaye: King of Comedy". The Pittsburgh Press. Retrieved March 10, 2011. ^ Edel, Leon (November 8, 1941). 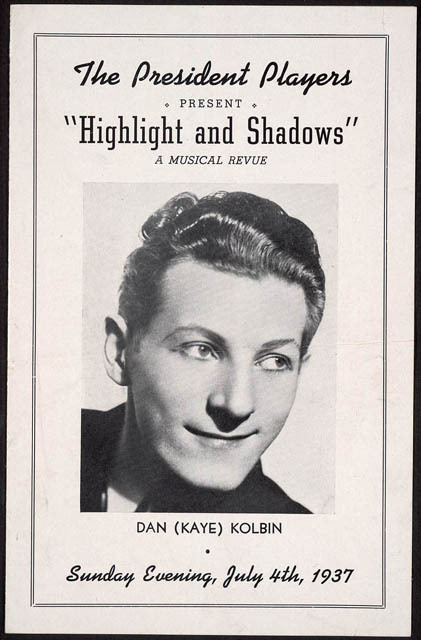 "Danny Kaye as Musical Draftee Brightens the Broadway Scene". Retrieved January 19, 2011. ^ Whittaker, Herbert (May 20, 1944). "Danny Kaye Makes Successful Debut in 'Up in Arms'". The Montreal Gazette. Retrieved January 22, 2011. ^ Kanfer, Stefan (1989). A summer world: the attempt to build a Jewish Eden in the Catskills from the days of the ghetto to the rise and decline of the Borscht Belt (1st ed.). New York: Farrar, Straus & Giroux. p. 157. ISBN 978-0374271800. ^ a b Nolan, J. Leigh. "Danny! Danny Kate F.A.Q.s". Archived from the original on January 23, 2013. Retrieved January 8, 2013. ^ Foley, Roy L. (February 2, 1946). "Helen and Danny: O-Kaye! Crowd Howls". The Milwaukee Sentinel. ^ a b "Danny Kaye". DigitalDeli. Archived from the original on January 6, 2012. Retrieved January 14, 2011. ^ a b BCL (November 12, 1945). "Riding the Airwaves". The Milwaukee Journal. ^ "Lily Pons the Guest Star Tonight of Danny Kaye, Back from Tour". The Montreal Gazette. November 23, 1945. Retrieved January 15, 2011. ^ Dorothy Manners, Manners (May 3, 1946). "Danny Kaye released from his radio contract". The Milwaukee Sentinel. ^ a b Boyle, Hal (August 27, 1959). "Composer Sylvia Fine Can Write Anywhere Anytime". St. Joseph News-Press. St. Joseph, Mo. Retrieved November 27, 2010. ^ Brady, Thomas F. (November 13, 1947). "Danny Kaye Film Set At Warner's". The Montreal Gazette. Retrieved January 18, 2011. 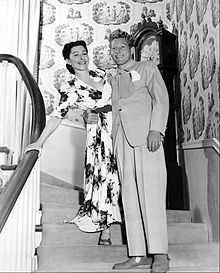 ^ "Danny Kaye in Film - Danny Kaye and Sylvia Fine: Two Kids from Brooklyn | Exhibitions - Library of Congress". loc.gov. February 14, 2013. Retrieved February 1, 2019. ^ Wilson, Earl (July 4, 1959). "It Happened Last Night". Sarasota Herald-Tribune. Retrieved January 18, 2011. ^ Young, Andrew (March 4, 1987). "Kaye: everyone's favourite". The Glasgow Herald. Retrieved December 15, 2010. ^ Januzzi, Gene (October 23, 1949). "Danny Kaye Won't Talk of Royalty". Pittsburgh Post-Gazette. Retrieved January 15, 2011. ^ Handsaker, Gene (October 11, 1948). "Danny Kaye Is a Real Showoff". Kentucky New Era. Retrieved March 12, 2011. ^ "Royal Variety Performance". Entertainment Artistes Benenevolent Fund. 1948. Archived from the original on February 9, 2011. Retrieved January 22, 2011. ^ "Royal Invitation for Danny Kaye". The Montreal Gazette. October 20, 1948. Retrieved January 22, 2011. ^ a b Sforza, John: Swing It! The Andrews Sisters Story. University Press of Kentucky, 2000. ^ Goldie, Tom (July 10, 1953). "Friday Film Notes-Danny--Producer". Evening Times. Retrieved March 10, 2011. ^ "Danny Kaye Founds Film Firm". The Pittsburgh Press. December 6, 1960. Retrieved March 10, 2011. ^ McManus, Margaret (September 23, 1956). "Found at Last: A Happy Comedian". The Milwaukee Journal. ^ Mercer, Charles (December 5, 1956). "Danny Kaye Gives TV Its Finest 90 Minutes". The Miami News. Retrieved January 19, 2011. ^ Pearson, Howard (December 3, 1956). "Color Shows, Danny Kaye, Draw Attention". The Deseret News. Retrieved January 19, 2011. ^ a b c Drew, Mike (March 4, 1987). "Danny Kaye always excelled as an entertainer and in life". The Milwaukee Journal. ^ "The Danny Kaye Episode Guide". Mateas Media Consulting. Archived from the original on October 29, 2009. Retrieved February 2, 2011. ^ Raidy, William A. (February 17, 1971). "Real people go to matinees and Danny Kaye loves 'em". The Montreal Gazette. Retrieved January 19, 2011. ^ Lowry, Cynthia (April 17, 1964). "Accident Confines Danny Kaye to Chair". Eugene Register-Guard. Retrieved January 15, 2011. 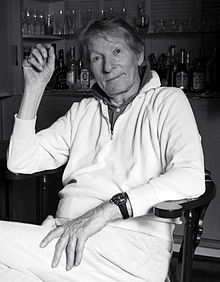 ^ a b "Actor-comedian Danny Kaye dies". Pittsburgh Post-Gazette. March 3, 1987. Retrieved December 15, 2010. ^ "Disney Avenue: Disney Documentary Hour: Disneyland's 25th Anniversary". www.dizavenue.com. Retrieved July 7, 2018. ^ "EPCOT Grand Opening". www.thisdayindisneyhistory.com. Retrieved July 7, 2018. ^ a b c d Jason Ankeny. 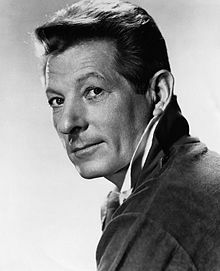 "Danny Kaye biography at". Allmusic. Retrieved January 13, 2015. ^ Bruce Eder. "Danny Kaye 1949 album review". Allmusic. Retrieved January 13, 2015. ^ Bruce Eder. "Danny Kaye Entertains record review". Allmusic. Retrieved January 13, 2015. ^ "Danny at the Palace". Discogs. Retrieved January 13, 2015. ^ "Knock on Wood OST". Discogs. Retrieved January 13, 2015. ^ William Ruhlmann. "Merry Andrew soundtrack". Allmusic. Retrieved January 13, 2015. ^ "The Five Pennies". Discogs. Retrieved January 13, 2015. ^ a b "Danny Kaye official biography". Retrieved January 13, 2015. ^ a b "Biography of Danny Kaye". The Kennedy Center. Archived from the original on February 26, 2010. Retrieved March 28, 2015. ^ Barrier, Michael (2003) . Hollywood Cartoons: American Animation in Its Golden Age. Oxford University Press. p. 463. ISBN 978-0-1951-6729-0. Retrieved September 13, 2016 – via Google Books. ^ Lehrer, Tom. "Lobachevsky Lyrics". Metrolyrics. Retrieved March 17, 2018. ^ a b c Rice, William (March 12, 1987). "Kaye Got Rave Reviews For A Starring Role As An Artist In The Kitchen". Chicago Tribune. Retrieved August 3, 2017. ^ a b "Marcella Hazan: Memoir of a classic Italian chef". Today.com. October 6, 2008. Retrieved March 10, 2011. ^ "Danny Kaye Teaches Chinese Cooking". Tri-City Herald. January 22, 1974. Retrieved January 15, 2011. ^ Culinary Institute of America, ed. (1995). Cooking secrets of the CIA. Chronicle Books. p. 131. ISBN 0-8118-1163-8. Retrieved January 18, 2011. ^ a b Boyd, Joseph G. (May 23, 1980). "Travel writer attends party saluting hotel". The Milwaukee Sentinel. ^ Scott, Vernon (July 14, 1962). "Kaye Likes Air". The Windsor Star. Retrieved March 18, 2011. ^ a b c Kaye, Danny (January 1967). "If I Can Fly, You Can Fly". Popular Science. Retrieved March 11, 2011. ^ Thomas, Bob (September 21, 1965). "Danny Kaye Likes Flying, TV, Dodgers". Gettysburg Times. Retrieved January 15, 2011. ^ Smith, Red (June 12, 1976). "American League's a new act for Danny Kaye". The Miami News. Retrieved January 21, 2011. ^ "History of Kaye-Smith". KayeSmith.com. ^ "Major League Baseball Returns To Seattle". The Leader-Post. February 9, 1976. Retrieved January 15, 2011. ^ "Crippled Transport Limps to Safety". The Lewiston Daily Sun. Lewiston, Maine. July 8, 1949. Retrieved January 19, 2011. ^ "Danny Kaye". UNICEF. Retrieved January 19, 2011. ^ Gottfried, Martin (1994). Nobody's Fool: The Lives of Danny Kaye. New York; London: Simon & Schuster. ISBN 0-671-86494-7. ^ Wilson, Scott. Resting Places: The Burial Sites of More Than 14,000 Famous Persons, 3d ed. : 2 (Kindle Locations 24772–24773). McFarland & Company, Inc., Publishers. Kindle Edition. ^ Taylor, Clarke (October 23, 1987). "UN and Friends Pay Tribute to Kaye". Los Angeles Times. Retrieved January 19, 2011. ^ Lewis, Paul (October 22, 1987). "U.N. Praises Danny Kaye at Tribute". The New York Times. Archived from the original on March 18, 2011. Retrieved March 18, 2011. ^ Teltschr, Kathleen (November 22, 1987). "Danny Kaye's Widow Backs Theater". The New York Times. Retrieved February 25, 2019. ^ "A team grew in Brooklyn". The Dispatch. Lexington, North Carolina. April 25, 1975. Retrieved March 10, 2011. ^ "Kaye at the Met". The Evening News. Newburgh, N.Y. April 25, 1975. Retrieved November 27, 2010. ^ Raymer, Dorothy (November 6, 1945). "Who Is Sylvia? What Is She? – Danny Kaye's Inspiration". The Miami News. Retrieved January 14, 2011. ^ "Movie producer, songwriter Sylvia Fine Kaye dies at 78". The Daily News. Bowling Green, Ky. October 29, 1991. Retrieved November 27, 2010. ^ Wilson, Earl (July 2, 1959). "It Happened Last Night". The Morning Herald. Uniontown, Pennsylvania. p. 4. Retrieved January 8, 2017 – via Newspapers.com. ^ "A Song Is Born". Tcm.com. Retrieved September 8, 2012. ^ Parsons, Louella (July 28, 1946). "Danny Kaye Awaits Christmas Bulletin On Maternity Front". The News and Courier. Archived from the original on August 21, 2013. Retrieved January 14, 2011. ^ Hughes, Alice (January 28, 1953). "A Woman's New York". Reading Eagle. Retrieved March 10, 2011. ^ Moody, Nekesa Mumbi (March 29, 2013). "On 100th anniversary of Danny Kaye's birth, daughter Dena seeks to spread his legacy". Times Colonist. Retrieved November 12, 2017. ^ "Kaye knighted". Times-News. Hendersonville, North Carolina. November 10, 1983. Retrieved March 24, 2014. ^ "Kaye, Willson to Get Medal of Freedom". Los Angeles Times. April 22, 1987. Retrieved January 19, 2011. ^ "Remarks at the Presentation Ceremony for the Presidential Medal of Freedom". University of Texas. June 23, 1987. Retrieved March 10, 2011. ^ "Theater Hall of Fame Adds Nine New Names". New York Times. November 22, 1988. Retrieved February 6, 2019. ^ "Humanitarian Award Winners". Lions Clubs International Foundation. Retrieved January 1, 2018. ^ "Danny Kaye-Hollywood Star Walk". Los Angeles Times. Retrieved January 19, 2011. ^ "Danny Kaye Visitor's Centre Virtual Tour". UNICEF. Retrieved January 19, 2011. ^ "Danny Kaye - About the Actor". American Masters. PBS. Archived from the original on January 15, 2018. Retrieved January 15, 2018. ^ "Oak Hills Terrace - A 'Back to School' Sale". San Antonio Express. August 3, 1969. p. 83. ^ "The Danny Kaye and Sylvia Fine Collection: About the Collection". American Memory. Library of Congress. Retrieved July 13, 2016. ^ "Quirks in the News". UPI Archives. Retrieved February 3, 2017. Remarks at the Presentation Ceremony for the Presidential Medal of Freedom, June 23, 1987; accessed March 9, 2015. 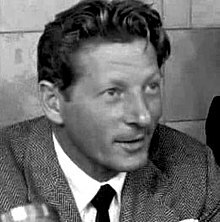 Wikimedia Commons has media related to Danny Kaye. Royal Engineers Museum, remuseum.org.uk; accessed June 4, 2017. Literature on Danny Kaye, virtual-history.com; accessed June 4, 2017. Eric Pace (March 4, 1987). "Danny Kaye, Limber-limbed Commedian, Dies". The New York Times. "Danny Kaye". Find a Grave. Retrieved March 24, 2014. FBI Records: The Vault - Danny Kaye, fbi.gov; accessed June 4, 2017. Interview with daughter Dena Kaye – The Spectrum, January 2016. 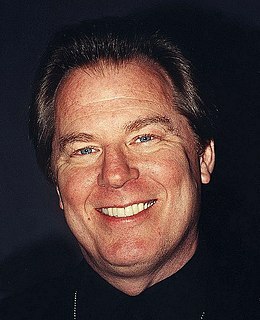 Michael McKean is an American actor, comedian, and musician, known for a variety of roles played since the 1970s. Laurence John Fishburne III is an American actor, playwright, producer, screenwriter, and film director. He is known for playing Morpheus in The Matrix trilogy, Jason "Furious" Styles in the 1991 drama film Boyz n the Hood and Tyrone "Mr. Clean" Miller in the 1979 war film Apocalypse Now. Daniel Louis Aiello Jr. is an American actor who has appeared in numerous motion pictures, including The Godfather Part II (1974), The Front (1976), Once Upon a Time in America (1984), The Purple Rose of Cairo (1985), Moonstruck (1987), Harlem Nights (1989), Hudson Hawk (1991), Ruby (1992), Léon: The Professional (1994), 2 Days in the Valley (1996), Dinner Rush (2000), and Lucky Number Slevin (2006). He had a pivotal role in the Spike Lee film Do the Right Thing (1989) as Salvatore "Sal" Frangione, earning a nomination for the Academy Award for Best Supporting Actor. He played Don Domenico Clericuzio in the miniseries The Last Don (1997). Clayton Holmes "Clay" Aiken is an American singer, television personality, actor, politician, and activist. He first gained fame when he came in second place on the second season of the reality singing competition American Idol in 2003. His debut album, Measure of a Man, released in October 2003, went multi-platinum. He released four more albums on the RCA label: Merry Christmas with Love (2004), A Thousand Different Ways (2006), the Christmas EP All is Well (2006), and On My Way Here (2008). 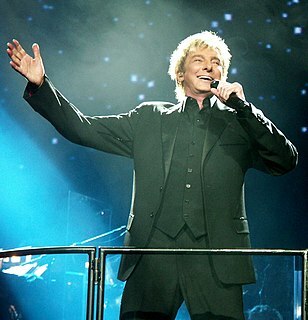 Since then he has released two more albums, both with Decca Records: Tried and True (2010) and Steadfast (2012). Aiken has also had eleven tours in support of his albums. In all, he has sold over 5 million albums, and is the fourth-highest-selling American Idol alumnus. 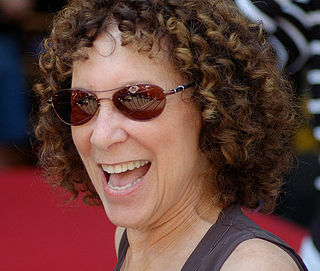 Rhea Jo Perlman is an American actress and author, best known for her role as head-waitress Carla Tortelli on the sitcom Cheers from 1982 to 1993. Over the course of 11 seasons, she was nominated for 10 Emmy Awards for Outstanding Supporting Actress – winning four times – and was nominated for a record six Golden Globe Awards for Best Supporting Actress in a Television Series. Knock on Wood is a 1954 comedy starring Danny Kaye and Mai Zetterling. Other actors in the film include Torin Thatcher, David Burns, and Leon Askin. The film was written and directed by Melvin Frank and Norman Panama, with songs by Kaye's wife, Sylvia Fine. Abe Burrows was an American humorist, author, and director for radio and the stage. He won a Tony Award. White Christmas is a 1954 American musical film directed by Michael Curtiz and starring Bing Crosby, Danny Kaye, Rosemary Clooney, and Vera-Ellen. Filmed in VistaVision and Technicolor, it features the songs of Irving Berlin, including a new version of the title song, "White Christmas", introduced by Crosby in the film Holiday Inn. Sylvia Fine was an American lyricist, composer, and producer, and the wife of the comedian Danny Kaye. She and her future husband grew up within blocks of each other in Brooklyn, but they did not meet until 1939. The Inspector General is a 1949 Technicolor musical comedy film. It stars Danny Kaye and was directed by Henry Koster. The film also stars Walter Slezak, Gene Lockhart, Barbara Bates, Elsa Lanchester, Alan Hale Sr. and Rhys Williams. Original music by Sylvia Fine and Johnny Green. A Song Is Born is a 1948 Technicolor musical film remake of the 1941 movie Ball of Fire with Gary Cooper and Barbara Stanwyck, starring Danny Kaye and Virginia Mayo. It was directed by Howard Hawks. Based on the Story "From A to Z" by Billy Wilder and Thomas Monroe. Produced by Samuel Goldwyn and released by RKO Radio Pictures. The Danny Kaye Show is an American variety show, hosted by the stage and screen star Danny Kaye, which aired on Wednesday nights from September 25, 1963, to June 7, 1967, on the CBS television network. Directed by Robert Scheerer, it premiered in black-and-white switching to color broadcasts in the fall of 1965. At the time, Kaye was at the height of his popularity. He starred in a string of successful 1940s and '50's musical comedy features, made numerous personal appearances at venues such as the London Palladium and his rare selective visits to the small screen were considered major events. With his recent motion pictures considered disappointments, three triumphant early 60s television specials led the way to this series. Prior to his film and television career, Kaye had made a name for himself with his own radio show, also titled The Danny Kaye Show. He made numerous guest appearances on other comedy and variety radio shows and headlined in several major Broadway musical revues throughout the 1940s. Selections from Irving Berlin's White Christmas is an album with songs from the 1954 movie, White Christmas. Among the featured artists are Bing Crosby, Danny Kaye, and Trudy Stevens, with Peggy Lee, who was not in the movie, singing some parts. It is one of the last 78 rpm albums Decca produced. This is a filmography for the American singer and actor Bing Crosby. Up in Arms is a 1944 film directed by Elliott Nugent and starring Danny Kaye and Dinah Shore. It was nominated for two Academy Awards in 1945.